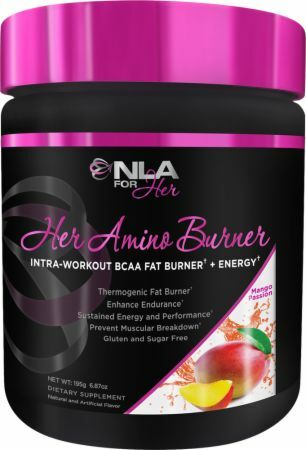 NLA for Her Her Amino Burner at Bodybuilding.com - Best Prices on Her Amino Burner! Anytime Energy Boost/Midday Pick Me Up: Enjoy 1-3 scoops of Her Amino Burner with water anytime during the day to increase focus and energy. The BCAAs in Her Amino Burner will also improve muscular recovery when at rest. * If you have difficulty sleeping we recommend to NOT consume Her Amino Burnerafter 5 pm. †Stack Her Amino Burner with our various NLA for Her supplements for maximum results in conjunction with a healthy diet and workout regimen. What type of supplement is Her Amino Burner and what are its benefits? How can Her Amino Burner help you achieve your fitness goals? It tastes amazing and lite! I usually take ore workout but lately I wanted something not so itchy and harsh on cardio/leg days, and this is perfect. Makes me sweat which motivates me more! Felt really good as well. Would highly recommend! I love this product! Sour apple is light and refreshing and I noticed a quick turn in weight loss with this product! Both flavors are great. This is my go to intra workout energy booster. I've tried both flavors of Her Amino Burner and both are amazing. I love this product. I take Her Amino Burner throughout each workout. I love the energy boost it gives me. I tried this and it didn't do anything. I expected some heat or some energy or anything and I felt nothing. I don't take a lot of supplements that could interfere with this product so I'm sure it didn't do anything. I tried sour apple flavor. It wasn't offensive like some other sour flavors but I wouldn't buy it just for the flavor. It was in-between good and bad for flavor, kinda neutral. It says its a "energy boosting, muscle building, fat burning supplement" but I didn't get energy or that hot feelings like other fat burners. Its just my experience, trying the product. If you can get sample somewhere and try it, maybe you'll like it. I mix 2 scoops in a jug of water and sip throughout my workouts. I can't train without Her Amino Burner. It seriously gives me the best energy. I'm not a fan of this pre-workout. I didn't feel like it gave me the "kick" I need before my 2 hours workouts. I had the Cherry Limeade flavor and it was awful. Her Amino Burner is my favorite during workouts. Both flavors are amazing and it keeps me energized and fueled the whole workout! Her Amino Burner is great for during workouts. It keeps me energized and I truly feel more endurance. Both flavors are delicious. I take 2 scoops mixed in my water jug throughout my workouts. I can say both flavor are amazing. I highly recommend both. Her Amino Burner always gives me a great energy boost throughout my workout. I'm so happy I found this supplement. It gives me great energy without any crash during my workouts. I really feel the metabolism boosters as well. Both flavors are delicious. * Percentage Daily Value are based on 2,000 calorie diet. Allergen Statement: Manufactured in a facility and equipment that handles: Egg, Wheat, Soy, Milk, Tree Nuts, Peanuts, Soybeans, Shellfish and Fish. Directions For Her Amino Burner: Consume 1 scoop your first time mixed with 8-10 oz of water. Add a 1/2 scoop each time based on your caffeine tolerance (100mg per 1 scoop). Do not exceed more than 3 scoops over a 1 hour time period. Her Amino Burner is meant to be ingested throughout the course of your training session. Do not exceed more than 3 servings per day.